View Video "Not Your Parents' Tech Ed"
View Video "Where the Jobs Are: Realistic Experience Key to Engineering Class Project"
Two USA Today videos feature innovative work-based instruction that teaches job skills to high school students from Cabrillo, Poly and the California Academy of Mathematics and Science. One of the videos, “Not Your Parents’ Tech Ed,” also features U.S. Secretary of Education Arne Duncan talking about the importance of using such hands-on instruction to help students understand the relevance of what they’re learning in class. The “Not Your Parents’ Tech Ed” video shows the hospital simulation class at Long Beach Memorial, where students from health pathways at Cabrillo and Poly high schools are seen interacting with working professionals and practicing their skills on life-like mannequins that groan and answer questions. The other video, “Where the Jobs Are: Realistic Experience Key to Engineering Class Project,” features teacher Joseph Carpenter’s high-tech engineering class, where students engage in a robotics and drone-building project. Students in the class present their projects to panels of industry experts from leading defense firms such as Northrop Grumman and Raytheon. USA Today ranks among the three largest newspapers in the nation. 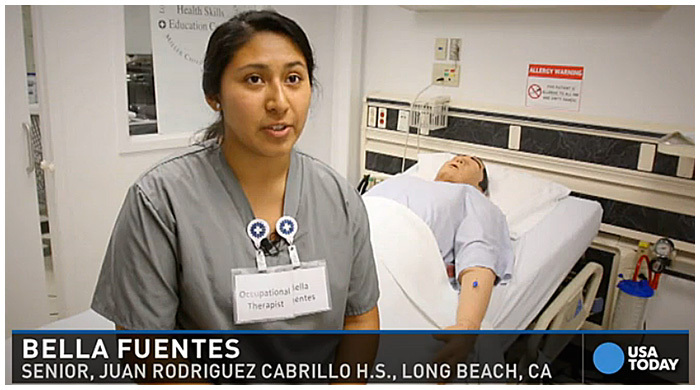 WORK-BASED LEARNING – Cabrillo High School student Bella Fuentes learns in a simulation lab at Long Beach Memorial.